Okay, this has nothing to do with silent film music. But just in case anyone's wondering what I'm up to, here's a run-down. Silent film screenings will resume in late January. "Vacation" is definitely the wrong word for this. A better way of putting it might be: "Planned near-death experience." How else to describe a journey that will take us far above treeline, into air with only half the amount of oxygen that we're used to, trudging across volcanic pumice and living for a week in tents but otherwise exposed to the elements? By elements, I mean jungle rains followed by extreme cold (well below zero at night) and potentially stiff winds at all hours. And it all takes place under the intense equatorial sun, which gets more intense the higher we go (despite the cold) because there's less of the Earth's atmosphere to protect us. Oh, joy! 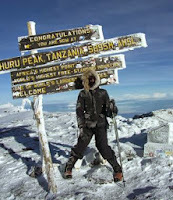 But this is what it takes to reach the summit of Mount Kilimanjaro, the highest point in all of Africa. And that's what I'm going to try to do, starting in a few days, with a group of 11 other intrepid adventurers. Some I've known for years, other I'll meet for the first time at Amsterdam Airport. That's where we change planes on New Year's Day for our flight to Tanzania. Kilimanjaro lies just below the equator, and just south of Tanzania's border with Kenya. 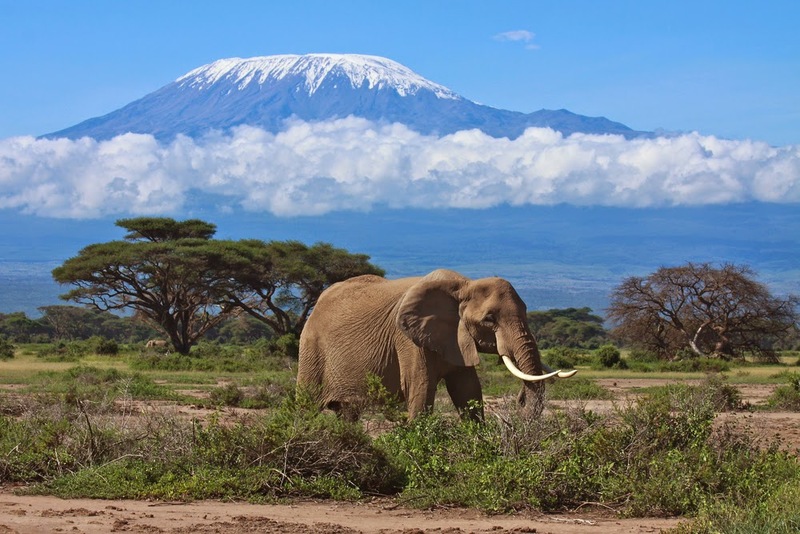 Kilimanjaro rises about 15,000 feet above the surrounding plains, making it the tallest free-standing mountain in the world. We'll be joined by a support group of no less than 45 others—a team that includes our guide, five assistant guides, three cooks, and several dozen porters to carry in (and out) everything needed for the expedition. We start on Saturday, Jan. 3. For seven days, we'll trek about 35 miles along the slopes of this gigantic dormant volcano, through five different climate zones. We'll slowly gain height, giving our bodies a chance to get used to the high altitude. And it all culminates on Saturday, Jan. 10, when we'll be wakened before midnight. We'll then don our headlamps for the final overnight push along a ridge and up to the summit. It's done in the wee hours because the scree is frozen in place at night, making footing much easier, I'm told. And if all goes well, we'll reach the volcanic crater rim about sunrise, and the actual summit (at 19,344 feet) a bit later. After spending only minimal time at the top, with its very dangerous lack of oxygen, we then make a quick descent, going down about 7,000 feet before the end of that very long day. 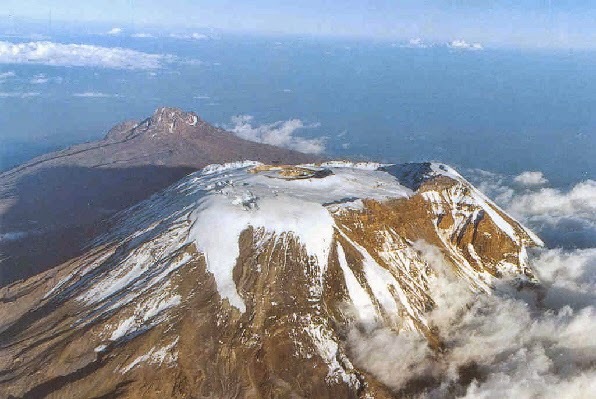 The summit of Kilimanjaro. You can see how it's a dormant volcano. We're aiming for the ridge on the right, Uhuru Peak, the actual highest point. That's one big honking "if," of course. Any number of things could keep some or all of us from getting there. But it's doable. So we're doing it, at least trying. So apologies to Yoda, who famously pronounced "there is no try." But then Yoda never attempted Kilimanjaro, as far as I know. Doing it, or even trying to do it, requires equipment, including a duffel bag of a certain size, which I didn't have. So I went shopping, and found that the local L.L. Bean store had several racks of returned canvas duffel bags at a hefty discount off retail. The reason for the discount: all the returned bags had been personalized with embroidered initials or names! So I looked through them, and narrowed it down to a dark green bag labelled "KYLE" in block capitals and a blue one with "Annemarie" stitched in cursive. I chose KYLE because of the color, although I have to admit I'd feel a little funny using a bag with "Annemarie" on it to climb Kilimanjaro. 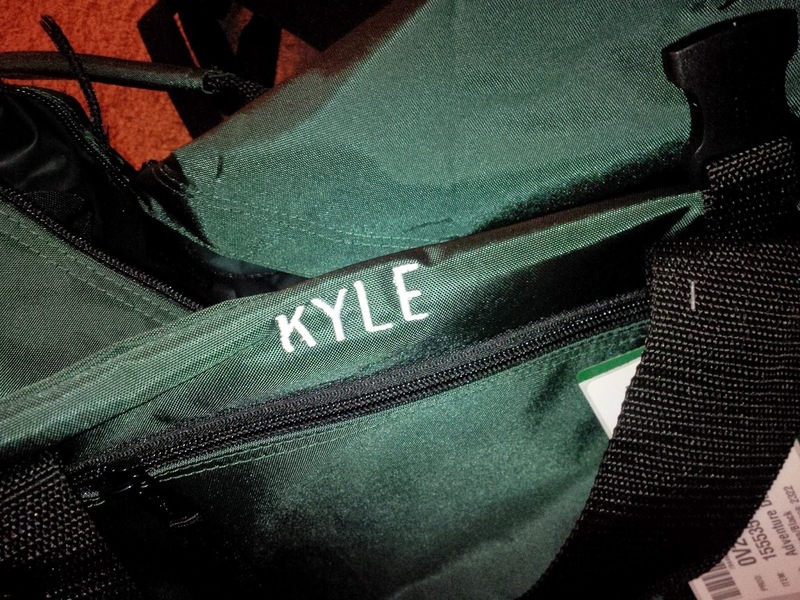 So KYLE, I don't know who you are, but the bag you rejected is going on quite a trip in a few days. 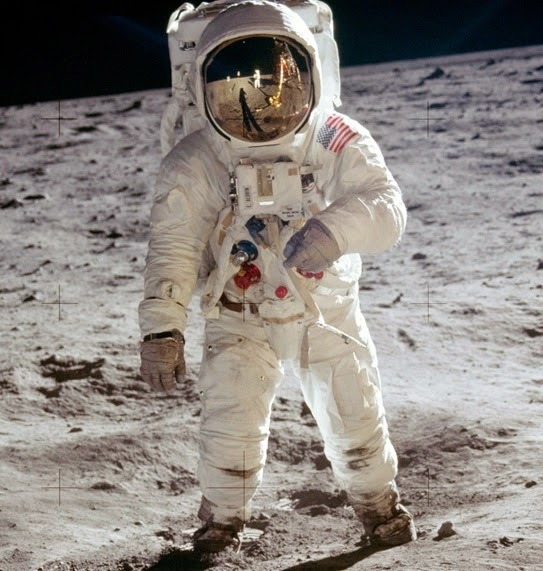 In some ways, it's kind of like the Apollo moon voyages some years ago. We spend all this time and preparation and effort to reach a very inhospitable place, where we stay for only a very short time before high-tailing it out of there and back to safety. On Kilimanjaro, there may or may not be cell signals or what-not available. But I'm not bringing my cell phone and will be genuinely off the grid for more than a week. There have been good omens. I went to a local credit union the other day to do some year-end banking for my mother, and the guy who sat down with me was from Zimbabwe, just south of Tanzania. Also, I discovered a wonderful store, Travel & Nature Adventure Outfitters in Exeter, N.H. and was delighted to discover that proprietors Robert and Sue Garneau summitted Kilimanjaro on their honeymoon back in the 1980s! Heck, even the guy that does my taxes climbed Kilimanjaro last summer. Everyone's doing it! Most interesting of all, earlier this month I learned that the conductor of the New Hampshire Philharmonic, Mark Latham, is the grandson of the first Englishman to summit Kilimanjaro, which happened back in 1926. Mark was gracious enough to have dinner with me and two other Granite Staters on our expedition, Dave and Patsy Beffa-Negrini. He brought along his grandfather's vintage photo album from the actual expedition, which included photos of the guy hoisting aloft a frozen leopard he'd found at high altitude. This discovery, widely reported and remarked upon at the time, became a symbol that inspired Ernest Hemingway to write 'The Snows of Kilimanjaro,' a mountain he never actually visited or climbed himself. Just like Yoda. Some mystic impulse within Harry and within the leopard drove them to seek out God, or the god within themselves, or immortality that resided far from ugly, mundane reality. In most civilizations, God or God's promise of immortality resides on the highest mountain top: Mount Olympus for the Greeks, Mount Sinai for the Hebrews, Mount Fuji for the Japanese. If the leopard was searching for some sort of immortality, then it found immortality at the summit of Kilimanjaro, where it lies frozen — preserved for all eternity. When Harry looks at Kilimanjaro, he sees it as a symbol of truth, idealism, and purity. When he dies, tragic irony exists. The leopard died in a high, clean, well-lighted place; Harry, in contrast, dies rotting and stinking on the plains, lamenting his wasted life and his failure to complete his desired projects. I'm not reading Hemingway's book, or doing any other kind of advance mental preparation for this adventure, other than to try to clear my mind of all expectations. I'd like to remain as open as possible to what I discover on my own. I know I'm looking forward to the night sky on Kilimanjaro. Because of the high altitude and the lack of human-produced light pollution, I'm told it's unlike anything visible where I live in North America. I'm looking forward to looking down on the clouds, if that happens. I'm told it's very similar to what you see outside the window of a plane, only without the plane. But most of all, I think I'm looking forward to the experience, and seeing if I really can do this. I'll figure out what it means later on. 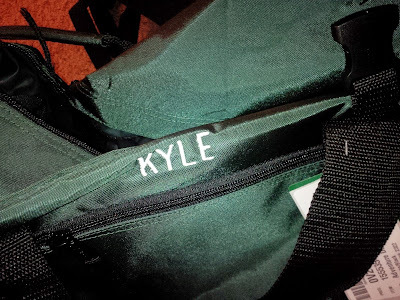 Heck, I might even change my name to KYLE. 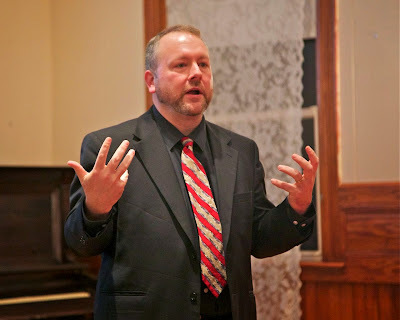 Pontificating prior to a show on Saturday, Dec. 13 at the Tuscan Opera House in Dixfield, Maine. Photo by Nick Waugh. And so we finish off the 2014 year with a program of Charlie Chaplin comedy shorts on Sunday, Dec. 28 at the Wilton (N.H.) Town Hall Theatre. But not before we finish some business here. Info about the Chaplin program is below. But as 2014 winds down, I thought I'd take a moment to gather my thoughts about the past year of presenting silent film with live music, and explore what 2015 might bring. • I feel in 2014, I reached a level where my accompaniment makes use of a definite musical vocabulary that's very much my own. So now that I've gotten to this point, in 2015 I'd like to devote more time to writing down finished music: not just silent film scores, but other pieces, too. I think it's time. My recent reconnection with the music of composer John Adams has pushed me into a place where I'm excited about the possibilities of new music. Also, I'd like to seek out opportunities to collaborate with other musicians on projects involving silent film or perhaps other material. Plus, I'd like to finally use my big bass tuba in a score. • In 2014, I ramped up the use of new social media channels to promote and discuss what I do. In 2015, I hope to continue this process and make more use of Facebook, Twitter, and other platforms to connect with audiences, supporters, and others in the vintage film community. • Also in 2014, I surpassed my goal of creating music for screenings of 200 different feature films. The numbers added up especially fast when I did a half-dozen programs of "animal" films this past summer in Wilton, N.H. Most of the animal shows were double features, and a couple were triple features, all of films I'd never done before. And many were quite good! For 2015, I think it'll be less about scoring films that are new to me (although I'll always want to keep exploring) and more about solidifying the material I have for some of the great films that are often requested for programs. After checking around, I found I wasn't satisfied with anything currently on the market. So instead, I found fairly new versions of my trusty (but worn out) equipment, and so renewed my gear that way. Thanks, eBay and Craigslist! I suppose at some point I'll actually buy some genuinely new stuff and get out of the "vintage synthesizer" rut. But for now, I think I'm all set for at least a few more years. For 2015, what I really need to do is work on getting more out of the Korg than I have been. The machine is cursed with a not-very-intuitive interface, so I never seem to get around to programming it to make the most of what it can do in live performance. • Total number of shows in 2014: 107 performances. For 2015, I'd like to still hit 100 just to keep up the pace, but I'm not going to obsess about it. Also, I've sometimes found I don't have enough prep or preview time prior to a film, and so don't have a chance to develop solid new material to work with when it's film scoring time. Also, I need to find room in my schedule to work on my keyboard technique and ability. I've developed some exercises to help me get around a little more nimbly and fill out chords on the fly, but I haven't done them consistently enough for the moves to be second nature. Okay, about the upcoming Chaplin program on Sunday, Dec. 28 in Wilton, N.H. I thought it was a fitting way to end 2014, which is the centennial of the 'Tramp' character as well as Chaplin's entry into the film world. For many in the silent film community, Chaplin was the "gateway drug" that got us started in exploring the field. That was certainly true in my case. My first exposure to silent film was my 7th grade music teacher running Chaplin two-reelers in 16mm as a way to keep students occupied during study hall. I remember the first one I saw: Chaplin's 'One A.M.' (1916), notable because Chaplin is the film's only performer, other than a brief scene right at the start with Albert Austin as a taxi driver. In more recent times, I've encountered more than a few film buffs who look down on Chaplin for whatever reason. But the thing is, his name still draws a crowd (more than any other silent film performer, I've found), and his films cam still produce gales of laughter in an audience that is otherwise not into silent film. So Chaplin is well worth reviving, especially due to the likelihood that someone new to this old art might become intrigued enough to explore it further. I'm not exactly sure yet which titles we'll have on the Dec. 28 program. But I'm confident we'll all have a great time laughing. For more info on the upcoming Chaplin program, please check out the press release below. 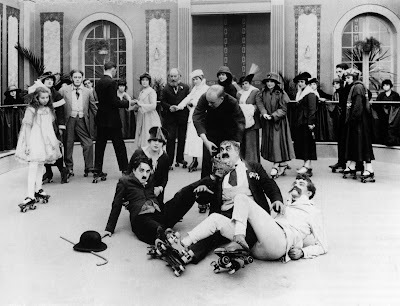 Chaplin causes roller-skating mayhem in 'The Rink' (1916). WILTON, N.H.—Charlie Chaplin's iconic "Little Tramp" character remains popular around the world more than a century after he first skidded onto the silver screen. But Chaplin's popularity first began with a series short comedies he produced and starred in during the early years of his career. See the films that first made Chaplin famous when the Wilton Town Hall Theatre presents a program of Chaplin's best short comedies on Sunday, Dec. 28 at 4:30 p.m.
Live music for the movies will be provided by silent film accompanist Jeff Rapsis. Admission is free; a donation of $5 per person is suggested to help defray expenses. The program will include several comedies made during Chaplin's "Mutual" period of 1916 and 1917. These two-reel films (each about 20 minutes long) are fast-paced, full of sight gags, and widely regarded as Chaplin's most popular short comedies. They show Chaplin in full command of his character as well as the then-new movie medium. Many were reissued and re-released to theaters throughout the silent period, even when Chaplin had moved on to make feature films. The program is family friendly and suitable for all ages. Newcomers to silent film with live music are especially encouraged to attend and rediscover this unique art form. "Seeing Chaplin on the big screen, with live music, and with an audience, is one of the great treats of the cinema, and a great way to cap off the long Christmas holiday weekend," Rapsis said. In reviving Chaplin's short comedies, organizers aim to show silent film as it was meant to be seen—in restored prints, on a large screen, with live music, and with an audience. "All those elements are important parts of the silent film experience," said Rapsis, who will accompany the movies. "Recreate those conditions, and classics of early Hollywood such as Chaplin's early comedies leap back to life in ways that audiences still find entertaining." Rapsis performs on a digital synthesizer that reproduces the texture of the full orchestra, creating a traditional "movie score" sound. He improvises the complete score in real time during the screening of each film. • Sunday, March 29, 2015, 4:30 p.m.: 'The Ten Commandments' (1923). Original silent film verson of the Biblical epic. Directed by Cecil B. Demille (who also helmed the 1950s remake starring Charleton Heston), this sweeping saga is a great way to mark Palm Sunday, one week before Easter. A program of Charlie Chaplin's best short comedies will be screened on Sunday, Dec. 28 at 4:30 p.m. at the Wilton Town Hall Theatre, 40 Main St., Wilton, N.H. Live music will be provided by Jeff Rapsis. Admission is free, with a donation of $5 per person suggested to help defray expenses. A dose of Harold Lloyd on Saturday, Dec. 13 in Dixfield, Maine will surely cure any holiday blahs. But still, a few screenings are booked: a Harold Lloyd program way up north in Maine's paper mill country; a screenings of Fritz Lang's 'Woman in the Moon' (1929) to employees of a Massachusetts film in the rocketry field; and a Chaplin program over Christmas weekend in Wilton, N.H. So if you're desperate for your silent film fix, there's enough out there for you to get through the month without too much risk of withdrawal. For now, here's info on the next upcoming gig: a Harold Lloyd program at the amazing Tuscan Opera House in Dixfield, Maine on Saturday, Dec. 13 at 7 p.m.
Having survived a huge fire in 1938 and then abandonment in the 1970s, it still stands, towering over neighboring structures in the tiny town center like Cinderella's castle dominates Disneyland's Main Street. Speaking of which: the program on Saturday, Dec. 13 will be highlighted by 'Dr. 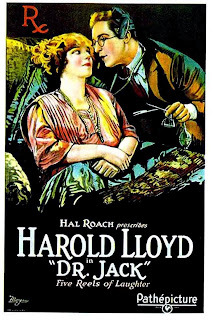 Jack' (1922), an early Lloyd feature that remains persistently popular with audiences. I included it a program in Brandon, Vt. in 2013 just because it's one of the few Lloyd features in the public domain that I hadn't run to death, and I was completely surprised at the uproarious laughter the picture generated. For a recap, I'm pleased to point to this post by the astute blogger known as Nitrate Diva, who sometimes attends the Brandon screenings. And for more information about the Lloyd program at the Tuscan Opera House in Dixfield, Maine, check out the text of the press release below. 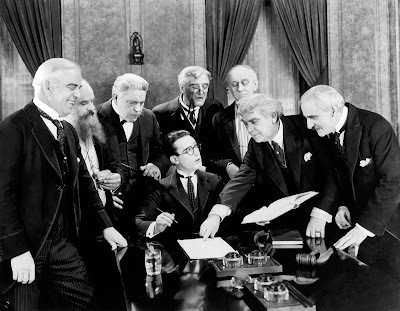 Harold Lloyd battles the medical experts in 'Dr. 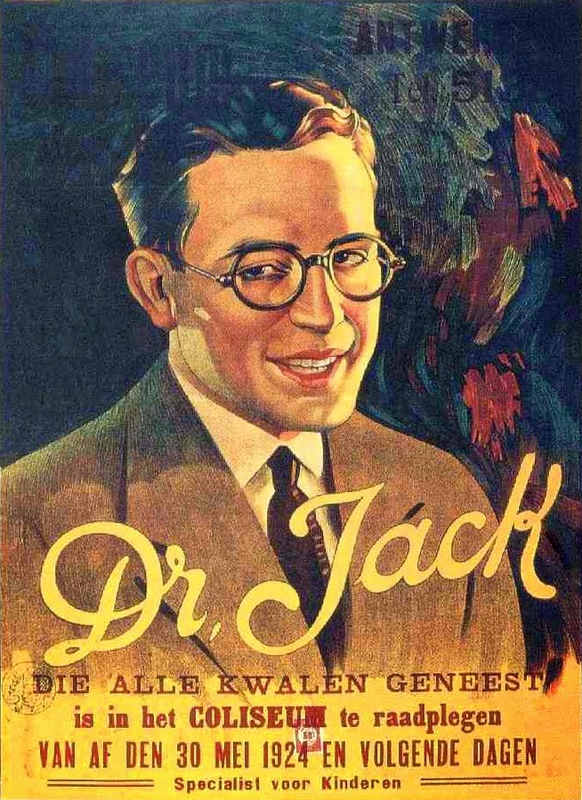 Jack' (1922). DIXFIELD, Maine—A comic icons of cinema's early days will return to the big screen for one night only, as the Tuscan Opera House presents an evening of silent film comedy with live music on Saturday, Dec. 13. The show begins at 7 p.m. and will feature films starring Harold Lloyd, the most popular comedian and box office star of the silent film era. Live music will be provided by accompanist Jeff Rapsis, a resident of Bedford, N.H. and one of the nation's leading silent film musicians. Rapsis will also provide background on Lloyd's career as well as introduce each film. "There's nothing like silent film comedy shown on the big screen with a live audience," said Rapsis, who regularly accompanies silent film screenings at venues around New England and beyond. The program is a follow-up to a well-received silent film show held last year at the historic four-story opera house. Last year's program featured Buster Keaton; this year's focuses on legendary silent film comic Harold Lloyd. "Harold Lloyd was a master of knowing how to make a large audience laugh," Rapsis said. "Seeing his films as they were intended to be shown is still one of the great experiences the movies have to offer." The program will be highlighted by the feature-length movie 'Dr. Jack' (1922), in which Lloyd plays a country doctor with methods that are unorthodox, but which get results. But now comes his toughest case yet: a rich girl (Mildred Davis) bed-ridden with a mysterious condition. Harold's cure is sure to make audiences smile! The program will be rounded out by other Lloyd films, all presented with live music. Lloyd's optimistic go-getter character was extremely popular throughout the 1920s, as audiences followed him from one adventure to the next. His pictures, with their mix of comedy, sentiment, and thrills, proved so successful that Lloyd was the top box office star during the silent era, outgrossing all other performers. The silent film program at Dixfield's Tuscan Opera House aims to recreate the full silent film experience, with restored prints projected on a big screen, live music, and the presence of an audience. All these elements are essential to seeing silent films they way they were intended, Rapsis said. Music is a key element of each silent film screening, Rapsis said. Silent movies were never shown in silence, but were accompanied by live music made right in each theater. Most films were not released with official scores, so it was up to local musicians to provide the soundtrack, which could vary greatly from theater to theater. Dirigo High School students present an evening of silent film comedy with live music on Saturday, Dec. 13 at 7 p.m. at the Tuscan Opera House, Maine Street, Dixfield. Admission is $10 per person, with all proceeds to go to the local historical society.